The Nexus 5 has been something of a rumored phone, with many Google fans and Android users anticipating its arrival. Earlier this summer, when Google unveiled its Galaxy S4 and HTC One Google Play Editions alongside of its now year-old Nexus 4, many (including myself) believed that the Nexus 5 was out of the running this year. I told readers after the GPE (Google Play Edition) smartphones were unveiled that when Google released its Nexus 5 smartphone (unless it would be named the second-generation Nexus 4), consumers would know it. Well, it seems as if the Nexus 5 is making its presence known. You can always count on Google to make waves with its products. At the Android 4.4 KitKat statue unveiling (by the way, the new statue is a chocolatey Kit Kat BugDroid), a man was caught taking photos of the Google one-billionth-device celebratory event with a curious Nexus device (yes, the “Nexus” name was clearly visible on the smartphone). At the time, it looked as if the device was, side-by-side with a Nexus 4 – and the curious Nexus smartphone looked bigger with a larger camera. There were no close-up photos of the new Nexus, but one could tell that it was a new phone that seemed to have a shiny “LG” logo at the bottom. It was said then that either LG or Motorola would make the Nexus 5, but no one knew for sure. The next time the Nexus 5 made an appearance was in an FCC filing where two phones, the LG-D820 and LG-D821 were discovered. One renown tech source said that the two LG models were nothing more than a CDMA variant of the Verizon LG G2. It was later discovered, however, that only one of the two LG models was a CDMA variant. While the LG-D821 model was a G2 CDMA variant, the LG-D820 model didn’t line up with the 5.2-inch LG G2 that was unveiled some weeks ago. In fact, the LG-D820 model had a 4.96-inch display, not to mention a camera at the left corner (as opposed to the G2 camera placement in the middle of the top front bezel). Since these specs do not match the 5.2-inch LG G2 or its features, speculation persists as to whether the mystery model is really an LG G2 variant or another LG phone – perhaps the new LG Nexus smartphone. 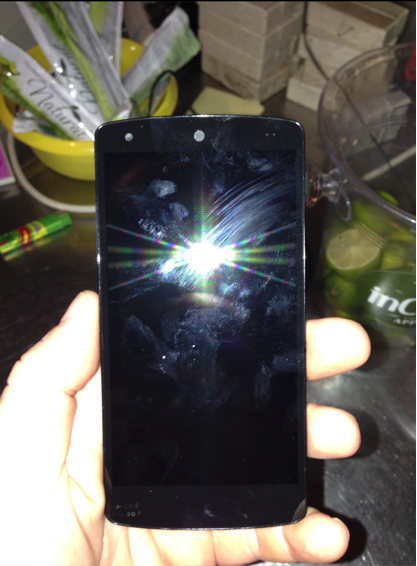 Now, new photos have surfaced of the Nexus 5, compliments of a Google employee who decided to leave the Nexus 5 in a bar so that someone could take photos and send videos across the Web. In other words, having left the device in the bar, the Google employee could be absolved of any guilt over leaking details about the device. 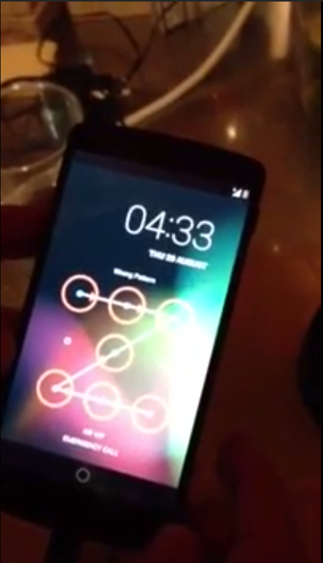 The Nexus smartphone left in the bar still maintains a Jelly Bean lock screen with the date “Tues 20 August” in the background. This is normal, but the Jelly Bean wallpaper used is that of Android 4.2.2, not the new Android 4.3 wallpaper we were hoping to see. We can see that the Nexus 5 has existed as of last month – right before Google released its first-generation Moto X smartphone from Motorola (now, “A Google Company”). Another photo of the smartphone display shows the Nexus bezel we have come to know and love alongside of the camera, seen at the left portion of the top bezel. This seems to be the same smartphone located in the FCC filing, the smartphone with the model number LG-D820. The camera placement for this new LG model smartphone is different than it was with the Nexus 4. 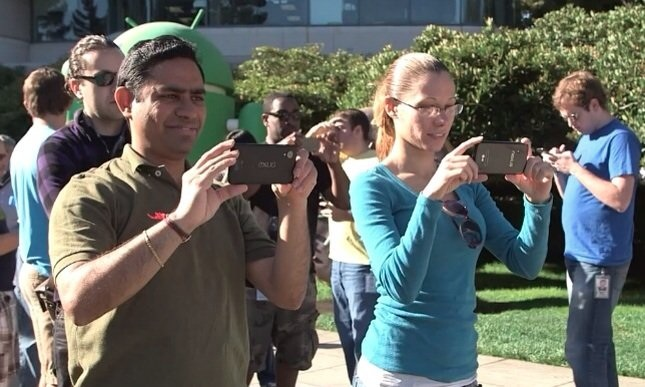 In the Nexus 4, the camera was placed to the right, but the new Nexus 5 shows us the camera has been moved to the left. In other words, we’re dealing with a new Nexus smartphone here, not the Nexus 4 that we have come to know and love. 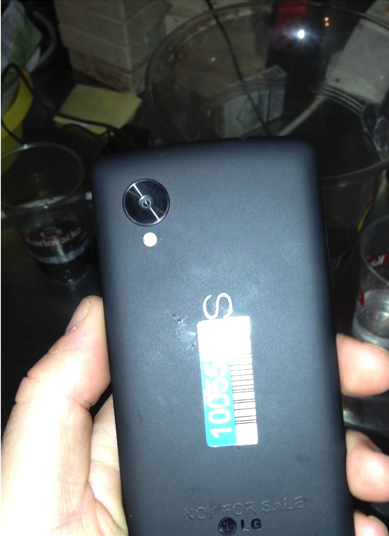 Another photo of the Nexus 5, taken in the bar, shows the back of the new Nexus 5. At the top, we see the rear-facing camera with a huge circle around it. We believe this large circle is nothing other than the anti-fingerprint lens that will surround the camera. The anti-fingerprint lens will keep off smudges and smears from the Nexus 5’s camera – another sign that LG will make the Nexus 5. LG’s own G2 has an anti-fingerprint lens surrounding its rear-facing camera as well, and it seems as if Google would want this feature on its new Nexus 5. I think Samsung should implement this feature on the future Galaxy S5. In the middle back of the Nexus 5, we can see that the letters “N-E-X-U” are concealed, with only the “S” hanging out from under the serial number (which, by the way, is 10055.” The serial number may be more than this, but these numbers are all we can see from the photo. At the bottom of the Nexus 5 are the words “Not For Sale” with the LG logo and name beneath it. This confirms for us that the Nexus 5 will not be made by Motorola (an earlier rumor) but by LG once again. One important thing to note: The back plate of the Nexus 5 shows that, unlike the Nexus 4, the Nexus 5 will have a smooth back plate akin to that of the 2013 Nexus 7 tablet. While some covet the glass back of the Nexus 5 and believe that a premium device deserves to sport a glass back, I like the soft-touch plastic back plate of the new Nexus 5. With a soft-touch plastic back in place instead of a glass back plate, the Nexus 5 will retain the premium feel of the Nexus 4 with an added touch of durability. Qualcomm’s Snapdragon 800 processor is the fastest processor chip in the world at the moment, and was unveiled during LG’s G2 presentation earlier this summer. The G2 was the first to sport it, but Sony’s latest Xperia Z1 as well as Samsung’s new Galaxy Note 3 “phablet” will sport Qualcomm’s latest and greatest as well. As for the camera, Google may look to enlarge its camera from an 8MP to a 13MP camera, following in the path of LG’s own G2. If so, we may see optical image stabilization on the device as well (don’t quote me on this). The newest Android OS update is Android 4.4 KitKat, referring to Google’s recent statue unveiling at its Mountain View, California headquarters. Google originally selected Android 5.0 Key Lime Pie for the new update, but changed it to Android 4.4 KitKat because the chocolatey dessert turns out to be more popular (and most people have never heard of KLP, according to news sources). Do you think that the new Nexus will be called the Nexus 5 or second-generation Nexus 4? Let us know in the comments below.